Large Heavy Duty Guillotine Cutter, Beautiful looking precise cutter that cuts very easily and straight. Had smaller plastic cutter that didn't cut as good as this one. Should last for the rest of my life. I was looking for a paper cutter that would do a good job on cardboard to make parrot toys with. This paper cutter is excellent. I use clean cardboard boxes and cut them into shapes to make parrot toys. I would definitely buy this cutter again. It slices through cardboard like a butter knife going through butter. Although this tool costs slightly more than competing products, it is WORTH the additional cost. Reason? read through the reviews for other products, and read the details about this one. The swing arm is dye cast steel. That is a big deal! I can see the precision and feel the power in my cuts on this Swingline. Also, I have every intention of using this tool regularly, and don't expect it will wear out or fall apart. Even the maple is gorgeous - no cracks or unevenness. The wood grain makes me happy. I bring work projects home so I can use my ClassicCut Ingento.The one thing I've done to improve my experience is purchase an aluminum drafting t-square. Since the 2'x2' space is so large, it helps me to have a second ruler and another point of contact for my paper stack. I got along fine without it, though - so I'm sure that it's simply personal preference. Welcome to MyBinding video. 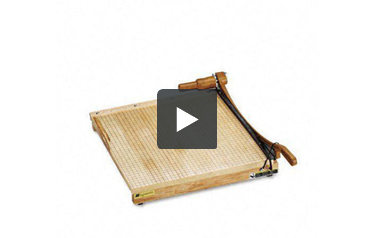 Today we look at the Swingline Ingento 18-Inch, an 18-inch maple guillotine cutter. With a classic look of solid maple, the heavy duty 18-inch Ingento will last you for years. Simply flip over the safety latch and you're ready to go. Align your papers on the US and metric grid and make your slice. The extra size 18-inch by 18-inch allows large documents, such as this, to be cut with ease. The Swingline Ingento can handle up to 15 sheets of 20lb paper. That was eight, this is 16, no problem. It's worth the investment for the Swingline Ingento. For more demos, reviews, and how tos on this product and many more, check out MyBinding.com. The Ingento 18" x 18" is a very popular guillotine cutter from Swingline. Here is a look at some of this machines various strengths and weaknesses. Perhaps the greatest feature of the Ingento 18" x 18" is the Ingento name itself. These paper trimmers are considered the industry standard and they are in use in schools, churches, and commercial print shops all over the world. They have a great reputation that they have earned by providing years of faithful service, and we see no reason why this machine won't do the same. Part and parcel of the reputation for durability, of course, is the solid construction of the Ingento 18" x 18". Using a base that is made of a chunk of solid maple, and a cutting arm that has been die cast of high-quality metal, this is a machine is built to last. This is a machine that has a nice weight to it, giving you a solid feel that leads to clean and precise cuts. There are rubber feet on the bottom of the machine that prevent it from slipping as well. Safety features are very important when it comes to guillotine paper cutters, and the Ingento 18" x 18" has a few that are worth noting. First, there is a latch for keeping the cutting arm locked down and immobile when the machine is not being used. There is also a steel spring tension system that keeps the cutting arm up in any position so that it will not drop if you take your hand off of it. And finally, there is a guard rail located on the base that will keep the fingers of the hand that is holding your paper well away from the blade. The blade itself is made of high quality stainless steel and actually sharpens itself while you are using it. It can handle not only regular paper, but photos, laminated sheets, and heavier stocks as well. Of course, any blade can get a few dings over time from accidental misuse and the like. The blade of the Ingento 18" x 18" can be taken off and sharpened, or replaced entirely if need be, saving you money over the cost of a new trimmer. The 18 inch blade on this machine not only allows you to cut letter and legal sized sheets with ease, it can handle larger custom sized projects as well. It may take up a little more space than its little brothers on the line, but it will still fit on the average desktop, and the increased capacity makes it worth it. The 15 sheet capacity (per lift) is suitable for up to medium duty use, but if you are going to be cutting thousands of sheets per week, you might want to look for a machine that can do a little more just to save time and effort. The safety features are well conceived, but guillotine trimmers like this one should not be used by inexperienced users unless they are being closely supervised. The same, obviously goes for children, should you be buying the machine for a school. Is there a replacement guard rail for this cutter? This machine currently does not have replacement parts however, it does have quite a long warranty on it so if you are having issues, you can call the Acco warranty line at 877-234-3192. Is there a replacement spring for this cutter? Thank you for your question. We contacted the manufacturer and they only stock the spring for the current version of the Swingline Ingento 18" x 18" Maple Guillotine Cutter. The current version were made in Taiwan. If you have a older cutter that was made in the USA they do not have any parts available for it. Is there a replacement blade for this cutter? Unfortunately Swingline/GBC does not make replacement blades for the Ingento series of trimmers. However, you can have the blade for your unit professionally sharpened multiple times during its life. Simply take it to a local grinder or sharpening service and they should be able to assist you.